After several years with no model railroad activities for myself, I have now more time and a renewed interest to involve myself in modelrailroading again. The last years I have been busy to work with Radio Filadelfia, a local christian radiostation, as a manager, responsible for both all the equipments and the editorial contents for the radio. In 2009 we have expanded to send 78 hours every week, a 400% increase compared to pre-2009. With this extra work and my normal day-to-day job as a system consultant, it have not been much time left for model railroads. Replace the old layout with a new. New revision 26.12.2010: A level with Tehachapi Loop is included!! 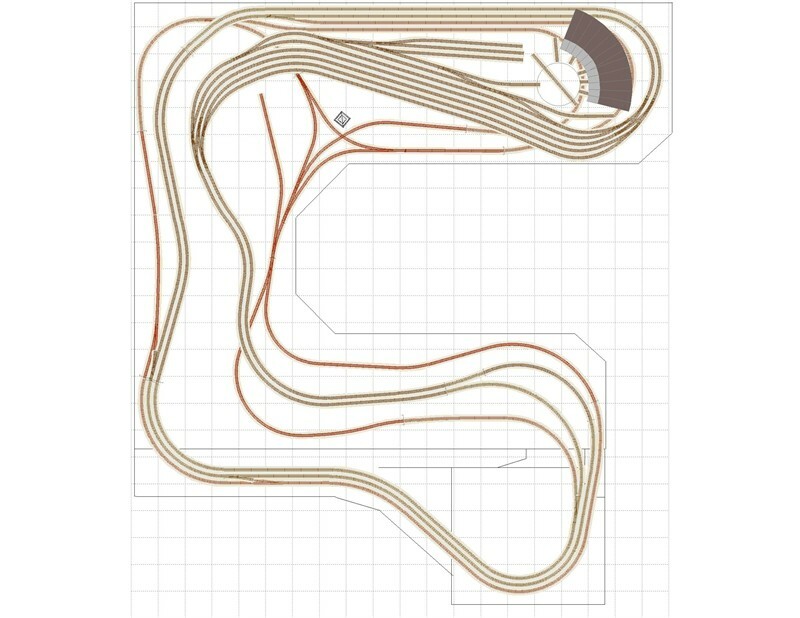 Track to be used: In visible areas; Microtrains flextrack and some Wright turnouts and handlayed turnouts. In hidden areas: Peco flextrack and Märklin turnouts. Conventional analog powering with sections, Tortoise(or similar) on all non-Märklin turnouts. You can follow the building in my Project Blog. Finally all the tracks are installed, except for a few feet of tracks on the highline, and the drawings are updated to asbuilt version. 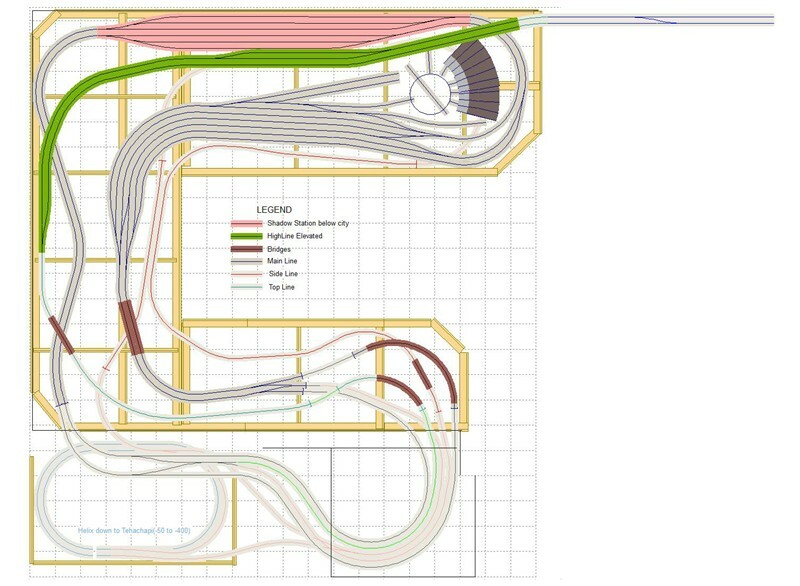 The layout are also divided into Power Districts, so its possible to run both DCC and conventional DC on the layout at the same time, like DCC on Power District A and DC on Power District B, if that is wanted. The different systems are selected with switches on the Power Routing Panel. Some yardtracks have also conventional wiring with the option to toggle power on the yardtracks when using conventional DC power. 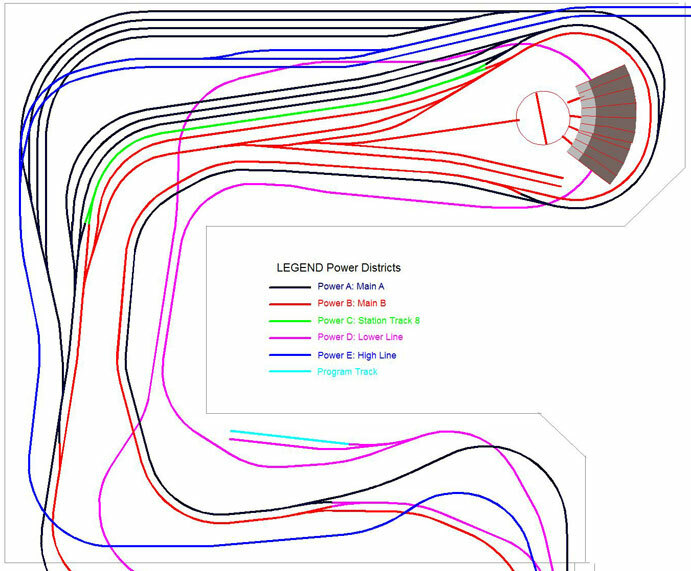 Check out the layout and the power districts on the final rev 8.3 asbuilt drawings. 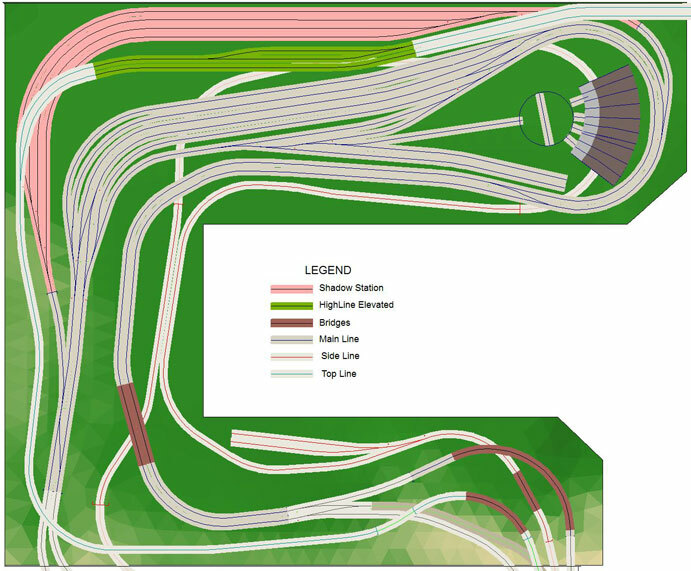 The development of the layout has gone from plans to physical building and near all tracks are installed. 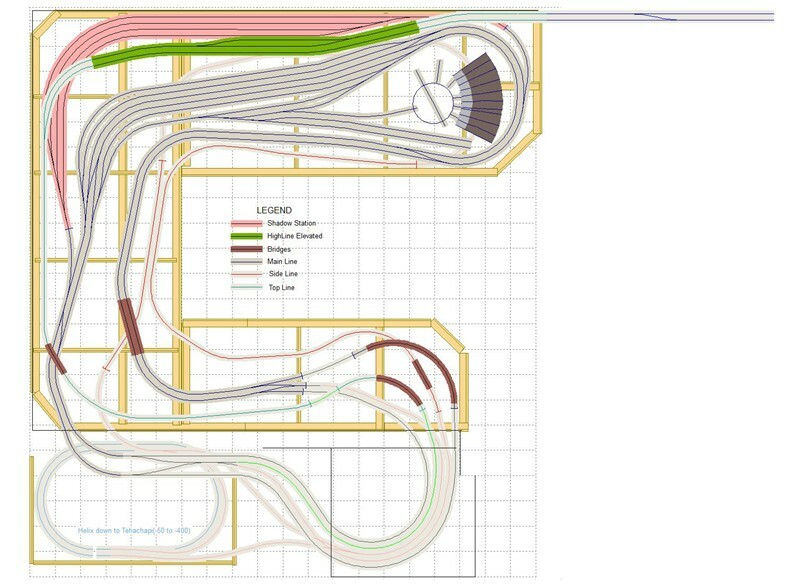 Check out the latest version of the trackplan and the different levels. 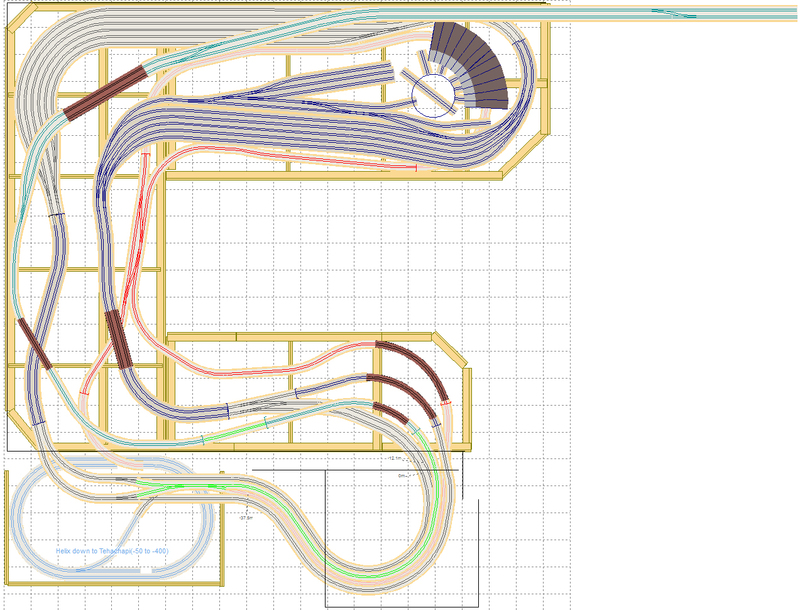 One good thing using the PC to develop a layout and to try different trackplans is an activity I love. 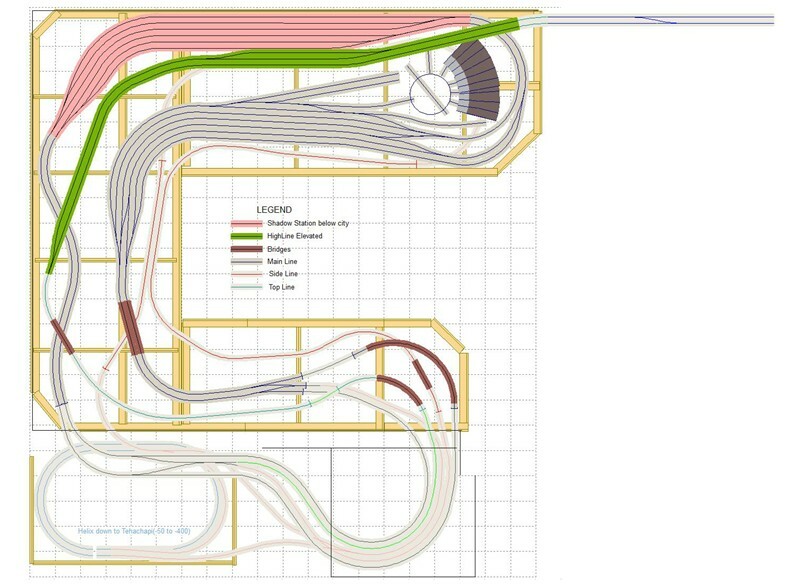 Now, when I have started to physically build the first feet of track on the layout, installing the lowest level, its time to freeze the development of the plans. But, new ideas pop up all the time. The last days, 3-4 major changes have been developed and refined on the layout, hopefully the last current version is the one that shall be build. From revision 4, there was an elevated track, used to divide the elevated city over the hidden station from the mainstation. I think thats a good idea, and want to keep that. Playing around on the internet to find real elevated tracks, I come over The High Line project. Yes, thats what I want to model!! The High Line project is about to preserve and develop what remains of the old High Line to public use today. The High Line was originally constructed in the 1930s, to lift dangerous freight trains off Manhattan's streets. On this The High Line project website I could fine a lot about the history and a lot of old photos that gave me the inspiration to include this as my elevated track on the layout. 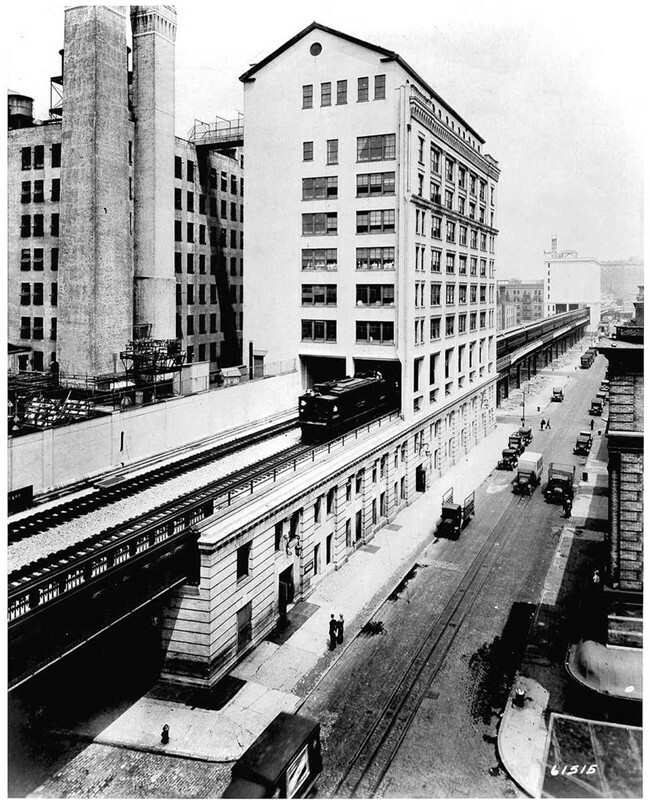 One image from the archives, Bell Telephone Company and the High Line running through the building, giving Bell direct connection to the line on their private siding. This image and many other, can be found here: The High Line In Operation. This is a major change in the concept of the layout. 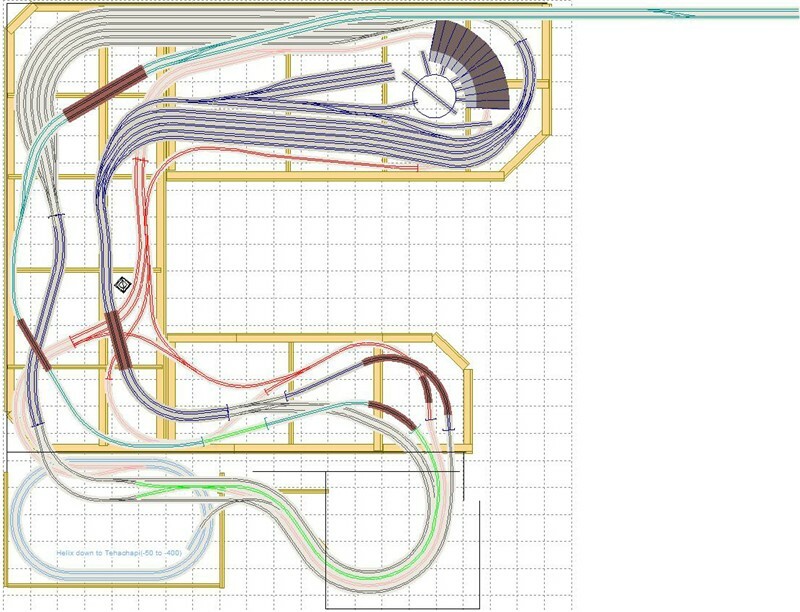 The mainstation is flipped around, so the entrance track coming from west now will follow the front of the layout the whole way along the the front board. This gives much more visible running on the mainline and also give a good solution on the main station. The hidden station and the elevated track are also redesigned. Some more turnouts needed to be installed on the mainline, so each track can reach the hidden station. 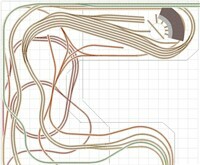 Now there are also some new tracks in the closed, so I can run trains before the helix even is build. 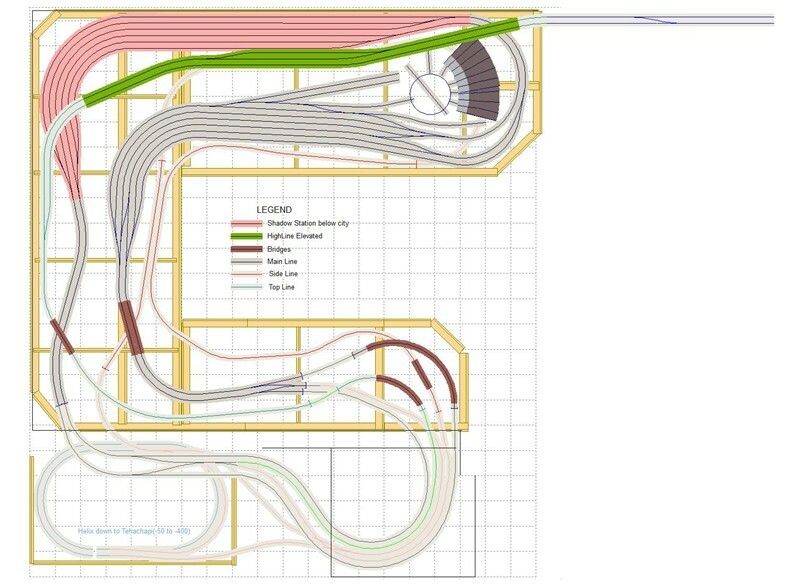 The lower level with Tehachapi loop and the big helix to connect both layouts are still in the plan, but now I can waith with that part and still run some trains. A lot of minor changes the last days when the building of the layout has started. 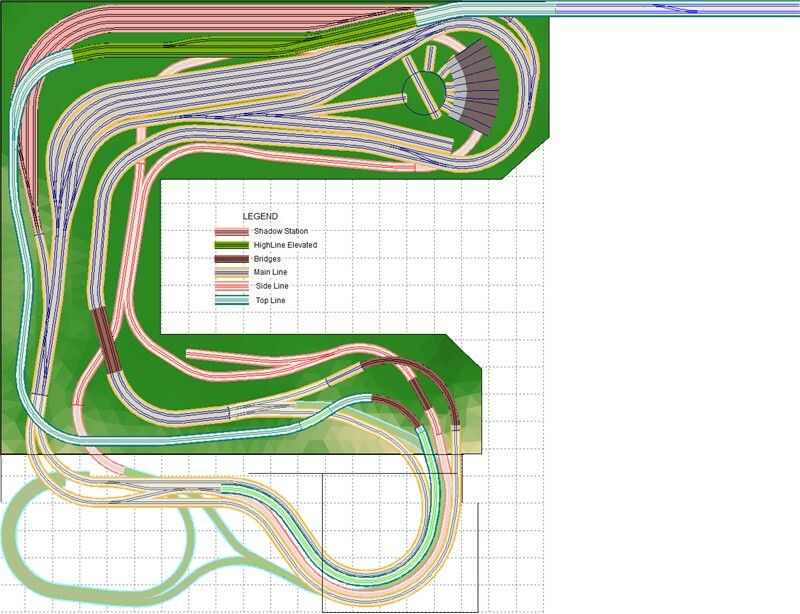 Now when the building is in progress, a lot of changes have been done on the trackplan. I have removed some tracks and removed some problemareas.The lower level with Tehachapi loop is not shown here, but it is not changed and will be used as it is now. After som more planning, I have changed the mainstation area, to give space for a hidden staging area. The old station has been rotated, and behind it now is space for a staging yard, hidden under the elevated city. That means that the maintrack level, looks to be lower than the cityscene behind it. The cityscene will be mounted so the buildings can be taken out to acccess the staging yard. The lower level has also been modified to give space for the rotated mainstation. The sigle topevel is cahnged a little, to be incorporated in the city. The rest of the layout is not changed from the previous revision. I think this new concept on the cityscene will make a better layout. Check out the new revision. May be the new layout could look like this? 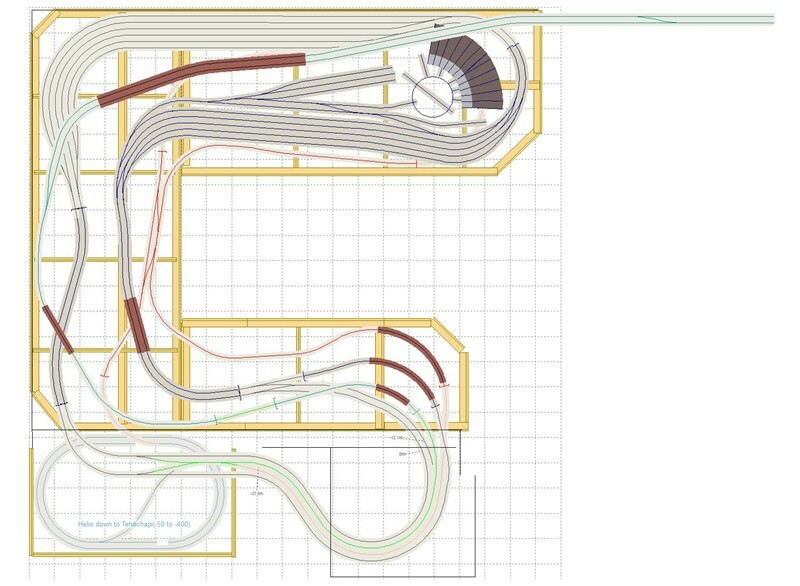 Here is a rough rendering showing the principle of the layout. On the right, the city building skyline, with relief building along the wall, covering the shadow station on top level. No bridges are installed, no tunnelportals and no water, but hopefully you will have an idea of how I think it could be. On the lower level you can see the Tehachapi Loop. A new revision. Always new ideas, but that's ok. I love to play with the PC and try different ideas. After some input from friends on the net about the Loop, I have done some rework on the layout; Removed the shadow station and created a 2 Level Layout, separated by a helix, with a model of Tehachapi Loop in California on lower level, based on my old drawings for a layout for Tehachapi. The Upper level is very similar to the previous version. Check out the new version. This new version has gone through many major changes. 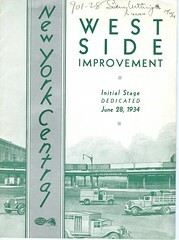 There have also been other revisions of the plans before this last, current plan. The new plan have the shadowstation back in, and a new top level has been added. 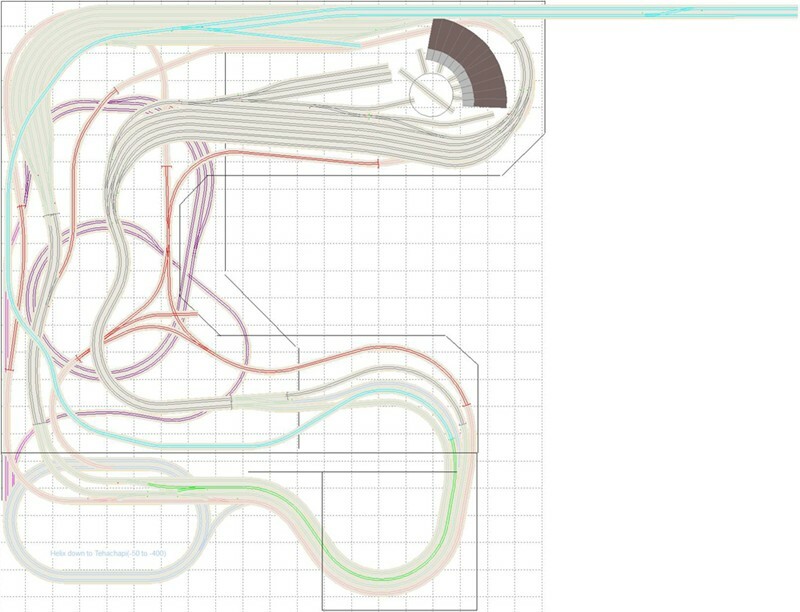 Some track have been removed, but it still looks like a spaghetti bowl, if you look at all layers. But if you only look at the visible tracks, it looks better. Check out the plan here. Some minorchanges in the yardarea have been done. 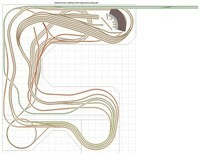 A new loop is included in the lower level and it was necesarry to move the mainpart of this level.